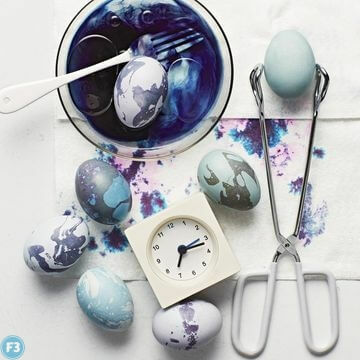 Make wow-worthy Dye Easter Eggs this year with our clever (and easy!) dying techniques. 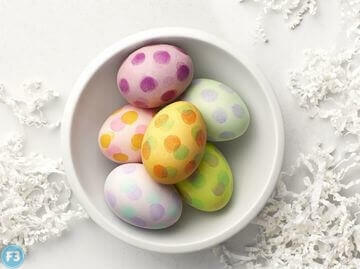 Our basic egg-dye recipe: -1 cup hot water – 1 tsp. white vinegar – 18 drops of food dye (we used McCormick brand); Dip 2 to 3 minutes for brights and 1 minute for pastels. Use the handy color cues at left to take the guesswork out of creating the perfect shade. Hard-boil right before dying: warm boiled eggs absorb color the best. A 2-cup-size glass measuring cup, such as Pyrex, is the most useful vessel for egg-dyeing. 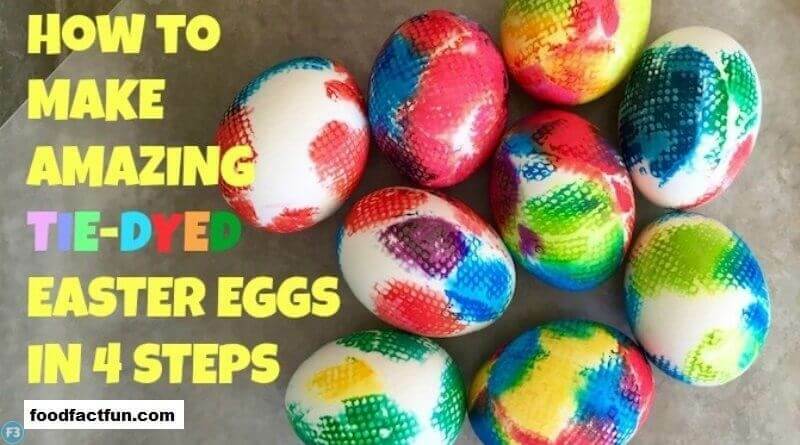 For evenly dried dyed eggs, place on a rimmed cookie sheet lined with layers of paper towels, which will absorb any excess dye that pools at the bottom. Scissor-style tongs (at right) are the best tool for retrieving eggs from their dye. To guarantee consistent hues, stir dyeing cups often. 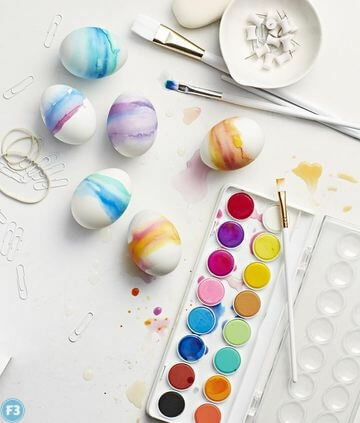 Dampen a boiled egg under water, then have your child apply washable watercolor paint to the wet shell using a small brush; you want the colors to bleed slightly on the damp surface. 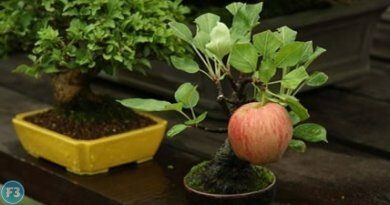 If you’d like the design to spread out more, lightly brush on more water. 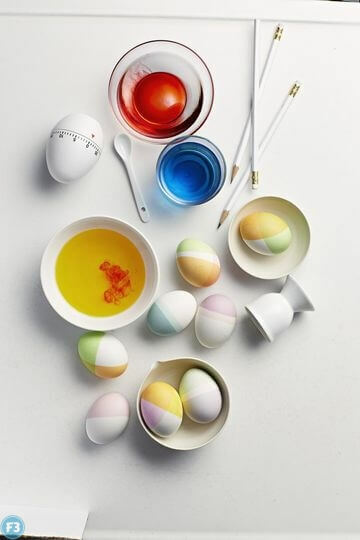 Pro Tip: Set your egg’s color by using a hair dryer on the lowest setting; move the dryer in small circles and hold it at least 6 inches from the egg for about 10 seconds. Dye eggs a light base color; let dry. Mix up a batch of very dark dye and place it in a wide, shallow bowl. Stir in 1 Tbs. of a light-colored oil, such as canola, to form swirls on the surface of the dye. 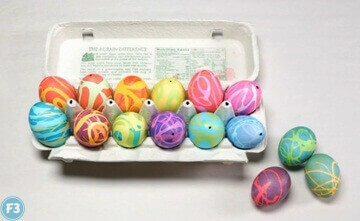 Roll egg in dye mixture and pull out carefully with tongs after 3 seconds; pat gently with paper towels, then let dry. Pro Tip: Room-temperature eggs and dye work best for this technique. If your materials are too warm the oil can slip off, too cold and the dye won’t absorb. Have your child submerge a portion of each egg in a fairly concentrated dye of her choice and hold it very still for a few seconds. Let dry, then repeat using a different portion of the egg and a new color of dye. Experiment with different color combinations, overlapping portions of the egg and leaving parts of the shell free from dye. Let dry after adding each new layer of color. Help your child snip rectangles, squares, and triangles from strips of electrical tape and apply the tape to shells. 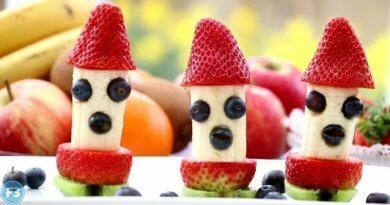 Dye the eggs; let dry. When eggs are fully dry, remove the tape to reveal geometric designs. Dye eggs a pale base color. Have your child press his fingertip into a nontoxic ink pad (VersaMark Watermark Stamp Pad, $10; joann.com), then lightly press and roll his finger on the eggshell to create dots. 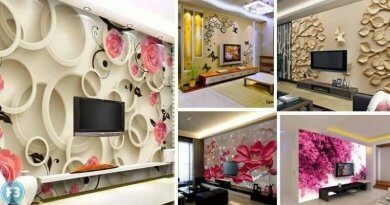 Allow ink to dry. 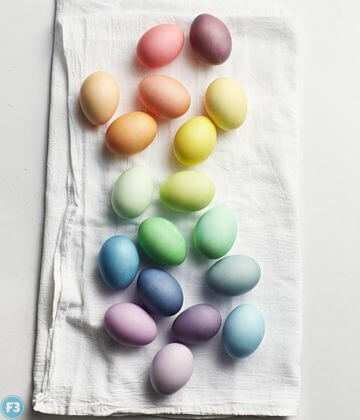 Create a beautiful ombré effect on Easter eggs with one simple trick. 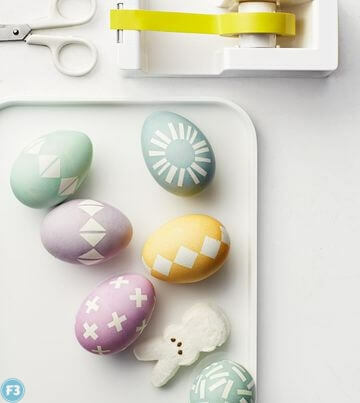 Drizzle on some rubber cement to create eye-catching Easter eggs.